Creating proposals is a time-consuming and tedious process. With today’s fast-paced and technology-driven world, not keeping up with the latest tech innovations for your business can lead to revenue loss and long sales cycles. In fact, 40% of employees in the sales department reveal they face problems with their sales contracting process. Implementing a sales proposal automation software mitigates various RFP (request for proposal) and proposal process bottlenecks and issues. It cuts down the time wasted in going back and forth with your proposals by at least 50%. When done manually, the document would have to be printed out, signed physically, and then scanned. This can cause a cycle of emails going back and forth between you and your clients that takes too much time and effort. The sales proposal software streamlines your RFP and proposal process. This improves your win rate, proposal automation, and company’s profitability by doing relevant tasks online such as signing documents, utilizing proposal templates, monitoring analytics, and integrating it with your Salesforce CRM. Finding the right software is vital to increase your business’ productivity and efficiency when managing proposals. In this article, you’ll learn more about the leading proposal management solutions to help you find which one fits your business needs best. DocSend is a robust content management and tracking platform designed to help sales and marketing teams improve productivity and efficiency with their sales proposals. It centralizes all your documents so you can easily monitor, update, find, and share them throughout its lifecycle. The software tracks their performance to give you relevant insights regarding your target accounts. It lets you use any device when doing presentations and proposals so you no longer need to download any files. Some of DocSend’s key features include screen sharing, conference lines, content performance and engagement reporting in Salesforce, account management, white-labeled document viewer, real-time document tracking, team reporting, and more. It also works seamlessly with multiple platforms and integrations like MailChimp, SalesForce, Zapier, IFTTT, and more. The web-based and mobile-friendly software is available in three pricing plans to cater to different types of users. It has an attractive, mobile-friendly document viewer that doesn’t require downloading. It organizes and sends presentations, proposals, and collaterals. 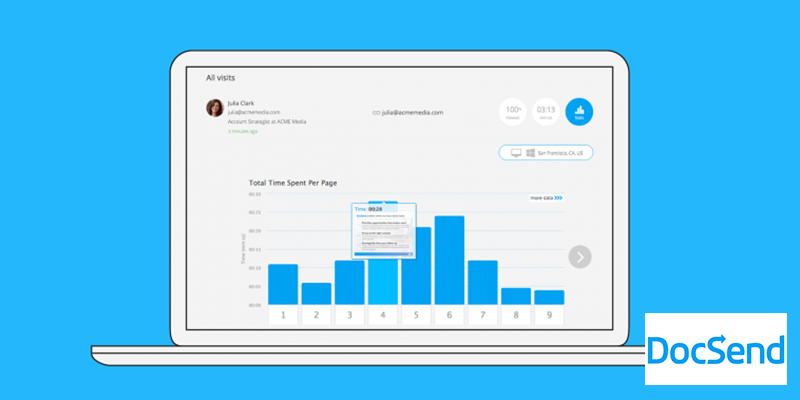 It monitors your documents with a page-by-page analytics and “read” notifications. It lets you make changes to the document such as fixing errors and updating permissions even when it’s already in the recipient’s inbox. It allows you to conduct presentations using any device—computer, smartphone, and tablet. It has pricing packages for personal, team, or enterprise usage. It lets you interact with your audience in real-time during a live presentation with a personal conference line. If you have other sales proposal management needs that don’t match with DocSend, we have compiled top 10 alternatives to DocSend you can choose from. These are some of the leading solutions in the niche for managing sales documents and proposals. Bidsketch is a straightforward proposal software that gets the job done and executes it well. It gives you features such as analytics, electronic signature, team management, real-time collaboration, and your own domain. Design templates are available to help you create a professional-looking proposal in just a few minutes that you can export to PDF. If you want to customize it, you can also use your own HTML/CSS designs. Increase your profits by adding optional fees and reducing writing time by recycling some designs, content, and fee information. Automating your new client workflow reduces your workload so you no longer have to manually send a special message after approval to prompt a deposit or attach a guide. You may also look at Bidsketch alternatives for other options. Why use Bidsketch instead of DocSend? It lets you have your own domain to establish your branding to clients. It has a 14-day free trial to let you check their features and tools. It shows you client activity once they have opened the proposal, posted a comment, and made changes. Why use DocSend instead of Bidsketch? It has an intuitive, easy-to-use, and well-organized interface design. It lets you easily switch from a DocSend presentation to a screen share session. It allows you to do a presentation using any device. Proposify is a simple cloud-based business proposal software to streamline your sales process from creating proposals to closing the deal. It is equipped with features like e-signature, templates, contacts, PDF export, notifications and analytics, branded URL, Stripe online payment processing, third-party integrations, phone support, document assistance, team and user permissions, and more. It offers various pricing plans to cater different types of users named à la Starbucks which are Tall (for individual users), Grande (for small businesses), and Venti (for larger businesses) which you can pay monthly or annually. It helps your business by maximizing your team productivity, organizing your entire team, and completing proposals faster. If you are looking for other options, visit these Proposify alternatives. Why use Proposify instead of DocSend? It has a full-featured, user-friendly editor for customizing business proposals. It integrates with Stripe so you’ll get paid immediately by your clients. It has a free iOS mobile app for monitoring your proposals and its metrics on your iPhone. Why use DocSend instead of Proposify? It lets you correct errors even when the document is already in your recipient’s inbox. It sends you real-time notifications when the client interacts with your document. It identifies who’s involved in the deal with org-mapping. Quote Roller is a smart sales document automation and quoting software. It focuses on providing quotes with proposal, CPQ, and contract management tools to help convert your leads into sales. It has a host of robust features including templates, documents, e-signature, document analytics, custom branding, email support, document builder and editor, product catalog, pricing tables, content library, private team training sessions, and more. Its subscription packages are available for individual users, small businesses, and growing companies. Its workflow automation makes team collaboration easier while the document analytics feature streamlines your proposal processes. It has a central catalog to quickly supply you with error-free quotes in consideration to margins, totals, discounts, and taxes. There are also Quote Roller alternatives to expand your options. Why use Quote Roller instead of DocSend? It uses CPQ (Configure Price Quote) to close deals faster. It has version tracking to record all versions of the document. It has a 14-day free trial with no credit card information needed. Why use DocSend instead of Quote Roller? It has a wide array of integrations. It uses org-mapping to determine any factors blocking deals. Qwilr is an interactive, mobile-friendly sales document management software. This modern-looking and attractive system include features such as click-to-accept, unlimited projects, notifications and view counts, e-sign and pay, audit trails, custom accept forms, custom subdomain or domain, analytics and security options, account manager, and more. Its pricing plans are for professionals, businesses, and enterprises. Qwilr has powerful quoting, media embedding, and editing tools so you can create beautiful and stunning proposals easily. Content is reformatted and resized dynamically in any device you view it from, whether it’s on your desktop, mobile, or tablet. Its interactive web pages replace the traditional PDF proposals, presentations and quotes to liven up your sales proposals. You may also check out Qwilr alternatives. Why use Qwilr instead of DocSend? It has a beautiful and simple user interface. It offers intuitive proposal presentations. It has a preloaded Template Library and it lets you clone a document or reuse your favorite sections to create documents faster. Why use DocSend instead of Qwilr? It is recommended for portfolio companies such as sales and fundraising. It revives lost deals, track ROI (return on investment) and marketing collateral performance. It can be utilized by startups for streamlining their sales processes. Highspot is an advanced sales enablement software tool to help sales and marketing teams make their content work into converting sales and closing deals. It is used by sales reps because of its effectiveness in delivery and powerful analytics engine. It has features like content scoring, document versions, semantic search, Salesforce integration, Office 365 and Google Apps editing, online meetings, pitch templates, and more. It uses Content Genomics and data science to provide advanced analytics, content scoring, and intelligent recommendations. It also optimizes your content, tunes your sales pitches, shares content through screen sharing and email, and improves your content management process. You may also read these Highspot alternatives. Why use Highspot instead of DocSend? It maximizes machine learning to boost its tools and features. It has a Page Builder to create focused content, devise guided experiences, and express announcements. Its Smart Update gives notifications for timely content and alerts you to changes made in the presentation. Why use DocSend instead of Highspot? It avoids getting your presentations into spam filters. It shows you sales-driven presentations to improve your business insights. Another leading software on this list of top 10 alternatives to DocSend is Octiv, a contract management and document generation platform equipped with various integrations and product solutions to streamline and automate your processes. Its core functions are creating, sharing, signing, storing, analyzing, and managing documents. You can follow-up your prospects in a timely manner as you will be notified when your client views your proposal. Accessing documents is also made easy because your prospects can review and sign them electronically using any device which you can send from your desktop, mobile or CRM system. It simplifies team collaboration, delivers professional proposals, and integrate data quickly. There are also Octiv alternatives you can check out. Why use Octiv instead of DocSend? It lets you base your document on client’s region, deal size, industry, and more. It allows recipients to interact with the document online through approving, completing tasks, negotiating and signing it electronically. It integrates CPQ software like Salesforce, Oracle, and Zuora for accurate quotes. Why use DocSend instead of Octiv? It eliminates the use of email attachments that might get lost in the inbox or spam filter. It loads files instantly and mitigates problems like loading a heavy PowerPoint file. It has org-mapping for tracking who’s engaged in the deal. PandaDoc is a document management software for simplifying and optimizing your team’s sales processes in creating, sending, and tracking documents. It is offered in pricing plans to accommodate the business needs and budget of individual professionals, small and medium businesses, and large companies. Depending on your chosen package, its features are document templates, e-signature, document analytics, custom branding, pricing tables, email and phone support, product catalogs, CRM integrations, auto reminders, content library, manager approval workflow and more. Since it is equipped with robust tools and features, you will gain complete control of your document processes and improve your team’s efficiency and productivity. With its AES-256 encryption, you’re assured your documents are secured. If you’re looking for other options, you may also view PandaDoc alternatives. Why use PandaDoc instead of DocSend? It has a fast software deployment procedure. It provides effective sales enablement for sales and marketing teams. It secures document with AES-256 encryption. Why use DocSend instead of PandaDoc? It sends you instant “read” notifications. It lets you do presentations using any device without having to download any files. It connects with a wide array of integrations. Qvidian is a cloud-based sales proposal automation software that focuses on mitigating common issues like inconsistency, manual process, lack of visibility, disparate content, and unavailable expert support. It provides easy retrieval of the right content and ensures they are compliant, up-to-date, and approved with security questionnaires. The system’s smart automation helps you make client-focused proposals to increase win rates. This also speeds up review and approval processes. It has a sales content portal, MS PowerPoint-compatible presentation, DDQ templates, and centralized content library. SOWs (statements of work) ensure your prospects are satisfied with your sales proposal through detailed scopes, reliable profitability based on planning, and specific workloads. For more options, you may also visit other Qvidian alternatives. Why use Qvidian instead of DocSend?  It maximizes any critical content in a centralized content library. It has professionally branded sales presentations that are compatible with MS PowerPoint. It has a sales content portal for easy and quick access to different types of sales content. Why use DocSend instead of Qvidian? It connects with a wide spectrum of platform and system integrations. It tracks the content use across your team members. It provides a single repository for all up-to-the-minute collaterals of your sales team. Loopio, an RFP software, is a robust solution for maximizing automation, improving document accuracy, simplifying sales processes, and centralizing all your content needs. Streamlining the process of creating sales proposals saves a relevant amount of your time. The system lets you build a framework so you can reuse the same content when needed and customize it accordingly. It also has an editor and customizable brand export templates to let you create professional, tailored, and branded sales presentations and proposals. Its other features include organizing your content, building a content library, keeping content up-to-date and tackling projects efficiently with a tight deadline. 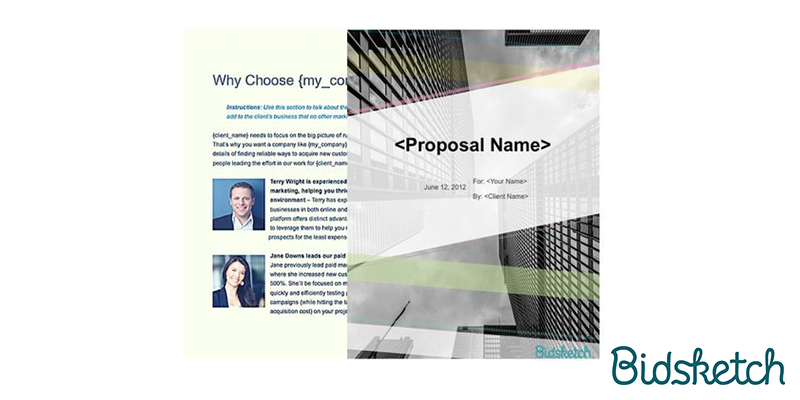 If it doesn’t match with your RFP needs, you may take a look at these Loopio alternatives. Why use Loopio instead of DocSend? It lets you respond immediately to clients by auto-populating answers from questions you’ve previously answered. It allows you to nudge team members who are late or absent on the dashboard to improve your team collaboration. It creates an efficient workflow for keeping your content fresh. Why use DocSend instead of Loopio? It tracks the performance of content and its ROI at each stage of sales funnel. It forecasts deals that are likely to close or identify which of them have stalled out. It lets you stay in control of your sales materials even after they’ve been sent out. If you’re tired of long-winding, back-and-forth communications when discussing contracts with clients, then Oneflow might be an ideal contract builder for you. This platform features live a contract editing tool that allows you to modify your contracts in real-time while you negotiate with your customers or prospects. Interactive proposals and pricing tables are also available for a hassle-free shopping experience for customers, thus eliminating the long waiting times for manual recalculations. It also features sales process automation, advanced permissions management, e-sign capability and signing workflows, contract analytics, document tracking, and more. You can peruse our Oneflow alternatives to find similar quality tools for your business. Why use Oneflow instead of DocSend? It features real-time contract editing. It allows prospects to continue shopping and adding more items to their shopping cart even after they’ve been given a quote thanks to its interactive proposals. It provides you with detailed contract analytics. Why use DocSend instead of Oneflow? It streamlines your entire content management processes. It lets you give presentations using any device without downloading any files. It organizes your campaigns, messages, and collaterals in a single, centralized library.